All the aspirants of Armed Police Force, are you willing to join the institution? If yes, Chekrs provides you the notifications of all those chances from where none of the CRPF Job Opportunities goes missing out. CRPF is among one of the very prestigious central government job. The organization has various positions announced regularly through the recruitment notifications. 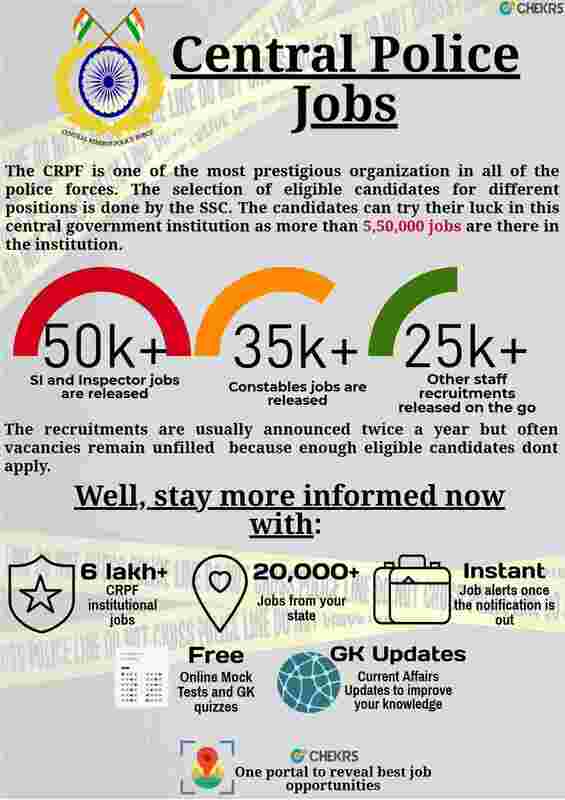 Whichever CRPF Recruitment 2019 you are preparing for, through this page you can know every CRPF Upcoming Vacancy released first. The team of Chekrs keeps tracks every announcement made by the CRPF Recruitment department to provide you favorable latest jobs. If you are interested to know the CRPF Upcoming Vacancy then you can take subscription of Chekrs and receive interested jobs without even searching them. As the department is under control of central government, the CRPF Jobs are released across India depending on the requirement. Well it’s not just the vacancies along with the CRPF Job Notification convenience also maters to us. Enforcing the same CRPF Sarkari Naukri choice, here you can browse ample of options with easy filters to show CRPF jobs in Telangana, Hyderabad, Andhra Pradesh, Punjab, etc. Moreover, besides the profile, you can even easily know the CRPF jobs for 12th pass, Nurses, Doctors, Diploma, ITI, etc. Why Chekrs for Latest CRPF Jobs? With the information we also aim to cater positive results. To make sure that you do well here we provide you the essentially required study material as well. As you will have to prove yourself in the written exam as well of CRPF Vacancy 2019 using the previous papers, online free mock tests and GK quizzes will help you sought out and improve efficiency.